Shakopee is a city in and the county seat of Scott County, Minnesota. Kick off your visit on the 28th (Tue): take in nature's colorful creations at Minnesota Landscape Arboretum. To see ratings, where to stay, traveler tips, and other tourist information, you can read our Shakopee travel guide. Use the Route module to find suitable travel options from Saint Paul to Shakopee. Expect a daytime high around 78°F in June, and nighttime lows around 60°F. Wrap up your sightseeing by early afternoon on the 28th (Tue) to allow enough time to travel to Fargo. Fargo is the most populous city in the state of North Dakota, accounting for over 15% of the state population. Kick off your visit on the 29th (Wed): examine the collection at Fargo Air Museum and then contemplate the long history of Bonanzaville USA. To find maps, ratings, where to stay, and more tourist information, you can read our Fargo travel guide. Use the Route module to find suitable travel options from Shakopee to Fargo. In June, daily temperatures in Fargo can reach 77°F, while at night they dip to 56°F. On the 29th (Wed), wrap the sightseeing up by early afternoon so you can travel to Bismarck. Bismarck is the capital of the U.S. On the 30th (Thu), let the kids burn off some steam at Fort Abraham Lincoln State Park and then contemplate the long history of On-A-Slant Village. To find where to stay, more things to do, photos, and other tourist information, go to the Bismarck travel guide. The Route module can help you plan travel from Fargo to Bismarck. In June, plan for daily highs up to 77°F, and evening lows to 53°F. Wrap up your sightseeing on the 30th (Thu) early enough to travel to Medora. Medora is a city in Billings County, North Dakota, United States. Start off your visit on the 1st (Fri): explore the striking landscape of South Unit. On the next day, trek along Oxbow Overlook. 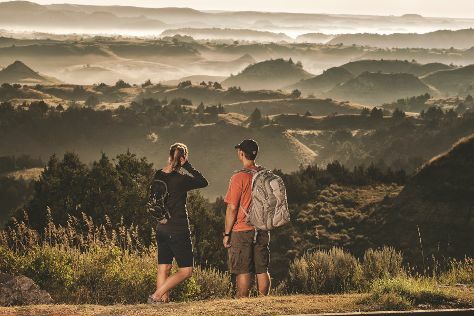 For ratings, maps, other places to visit, and more tourist information, you can read our Medora travel guide. The Route module can help you plan travel from Bismarck to Medora. The time zone difference moving from Central Standard Time (CST) to Mountain Standard Time (MST) is minus 1 hour. In July, daytime highs in Medora are 83°F, while nighttime lows are 57°F. 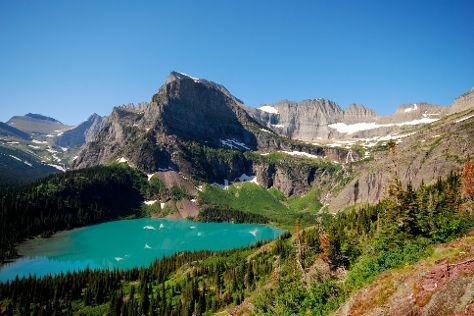 Wrap up your sightseeing by early afternoon on the 2nd (Sat) to allow enough time to travel to Glacier National Park. Discover out-of-the-way places like Swiftcurrent Lake and Trail of the Cedars. Go for a jaunt from Glacier National Park to West Glacier to see River Rafting & Tubing about 44 minutes away. There's lots more to do: take in the dramatic natural features at Grinnell Glacier, appreciate the extensive heritage of Garden Wall, take in the dramatic scenery at Virginia Falls, and explore the activities along St. Mary Lake. To see ratings, photos, maps, and tourist information, read our Glacier National Park travel guide. Explore your travel options from Medora to Glacier National Park with the Route module. Expect slightly colder evenings in Glacier National Park when traveling from Medora in July, with lows around 49°F. Finish your sightseeing early on the 6th (Wed) so you can travel back home.